Slow Metabolism ... are you becoming a sloth by dieting? All temporary diets fail because they slow metabolism making it impossible to lose fat! Is your diet turning you into a sloth? 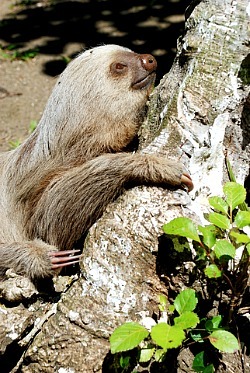 sloth - n. 1.aversion to work or exertion;laziness;sluggishness. 2.any of various slow-moving, arboreal mammals of the family Bradypodidae, of tropical America. Why do diets slow us down so much and make us fatter? Cute as this furry critter is, none of us wants to be a slow-moving, work-averting sloth! Besides, when you are slow to metabolize your food you get fat! Diet plans, especially the more exotic ones that promise that you'll lose 21 pounds in 21 days, for example, require serious restriction of calories which leads to initial weight loss followed at some point by serious fat storage. Our bodies can't tell the difference between deprivation and starvation so they go into survival mode. Just the opposite of what you are hoping to accomplish happens. Instead of losing fat your metabolism slows down and your body begins to store fat. Your body is just trying to protect you. No wonder diets become an unproductive cycle of what we call the "roller coaster effect." Active women need at least 1,200 - 1,500 calories a day to lose weight and prevent fat storing mechanisms from being triggered and slowing down your metabolism. Eating less than 1,200 calories a day allows a neuropeptide to kick in and stimulate hunger. Your body will be busy storing fat and telling you it's starving! So it's just as important not to eat too little which slows your metabolism as it is to eat too many calories. Spreading 1500 calories out into 5-6 small meals a day will lead to more balanced blood sugar and higher metabolic activity. Generally active women can lose weight if they consume 1200 - 1500 calories a day of the right type of food. A key concept for success in getting to a healthy weight range is to get the energy balance right. This is the relationship between energy expended and fuel (food) eaten. All serious weight loss programs take into account the proper metabolic balance in eating. The key to balancing your metabolism: think of food as fuel. When you eat to live instead of live to eat, you are primarily concerned with your health. You need to treat your body like a Ferrari only putting the best fuel (food) into it to get maximum performance. When you are not moving your body enough and consuming too many high glycemic foods, your energy balance is out of whack. You have slow metabolism and you become fatter. So what does BMR (basal metabolic rate) refer to? The rate at which our bodies use energy and burn calories is called the metabolic rate. The BMR is the resting metabolic rate - how much energy you use and the calories you burn when you are at rest. It's a baseline. Restrictive low calorie diets cause your basal metabolic rate to drop by 20 - 30%! Now that is sluggish or slow metabolism. It's easy to get stuck in a pattern that leads to low energy, slow metabolism and eating high glycemic foods to boost energy. You get fatter and fatter in spite of periodically starving yourself, in fact, because of it! It's not surprising that only 5% of the population loses fat on a diet. What they do lose is often water and lean muscle. If you know your BMR you know how many calories you burn without getting out of bed. Your BMR calculator tells you how many calories you need a day to function. If you eat less than you need your body will have to slow your metabolism and store fat. Diets that have you consuming too little food are counter productive. It's important to strike the right balance in order to reach your healthy weight range. Ever wonder why you gain more weight back after dieting? Your fat cells don't go away although they could shrink if you are starving yourself. The minute you go back to your old ways of eating and your blood sugar is spiking again the fat cells not only expand again but multiply! The next time you gain weight you balloon out again and you add more adipocyte cells or fat cells. So you end up being bigger than before you started the diet. Fat cells or adipocyte cells will always multiply when you are not expending enough energy for the amount or type of food you are eating. That means you are putting more food into the body (fuel) than the body can use. When you then go on and off a diet you expand and increase your fat cells and get bigger until the next diet. This up and down cycle not only expands and increases your fat cells but it can turn you into a sloth! Slow metabolism is not a formula for how to lose fat. You can turn around your slow metabolism no matter how much of a rut you are in! I am a certified weight management adviser and I can show you how if you fill out a survey for an HOUR long weight management consultation. It includes 3 months of coaching and a written plan. This is an aggressive, comprehensive plan that produces results. This is a safe, natural fat blocker that really works and burns fat effectively. 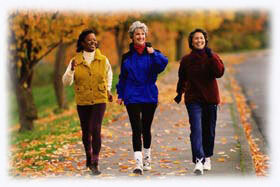 Your best weight loss plan includes using a pedometer to increase your activity and speed up your metabolism. Walking increases metabolism, improves insulin sensitivity, relieves stress, improves almost every body function you can think of....including assisting fat loss! How many calories burned swimming, cycling, running, walking...find out how many calories you use in a minute, an hour? Wonderful as tea is to drink it also helps your fat loss! There are very specific qualities about your exercise you MUST have in order to lose weight! Return from Slow Metabolism to Best Exercise to Lose Weight. Return from Slow Metabolism to Lifetime Fat Loss home page.